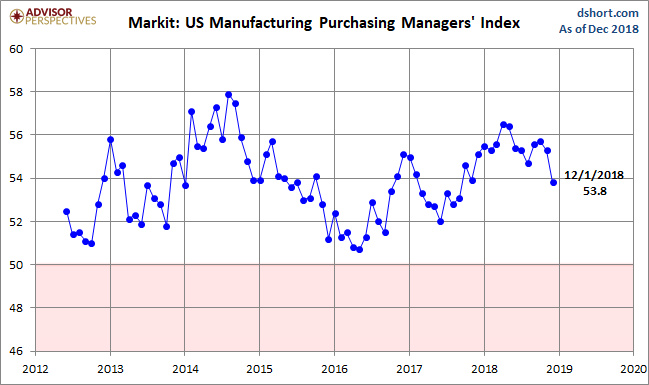 The December US Manufacturing Purchasing Managers' Index conducted by Markit came in at 53.8, down 1.5 from the 55.3 final November figure. 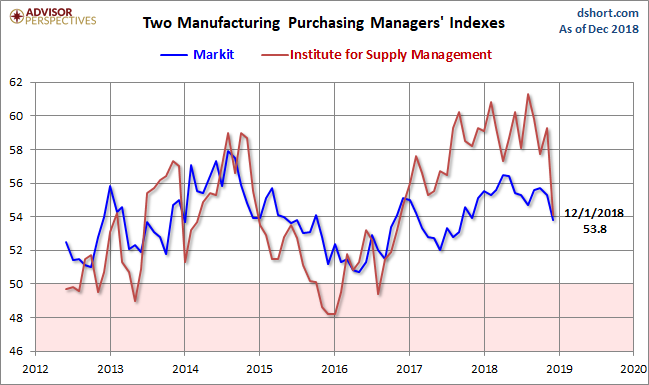 Markit's Manufacturing PMI is a diffusion index: A reading above 50 indicates expansion in the sector; below 50 indicates contraction. Here is a snapshot of the series since mid-2012. Here is an overlay with the equivalent PMI survey conducted by the Institute for Supply Management (see our full article on this series here, note that ). The next chart uses a three-month moving average of the two rather volatile series to facilitate our understanding of the current trend.